With the 360 and PS3 version deep in development, there's another Army of Two game on the radar ready to bring buddy action on the road. 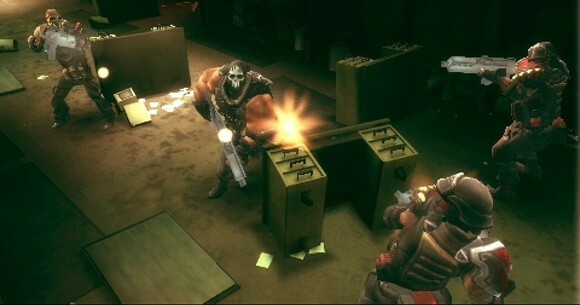 Army of Two: The 40th Day for the PSP plays to the portable platform's strengths, forgoing a 3rd person shooter in favor of a more top down game similar to Smash T.V. The boys at Joystiq came away fairly impressed with what they saw, a good portion of the console game was translated into and adapted to the PSP. Cover and aggro still play a large part in the two player co-op game, even if it's from a slightly different perspective. IGN also laid out some details of the game, and seemed equally impressed. The controls were simple enough, with the Left Analog stick controlling player movement and the right ana..err..the face buttons controlling directional shooting. Players are still able to revive their buddy, which of course plays a crucial role in any co-op game. But what really stood out for IGN? The boss battles. After running down the building, jumping into a hole left by a rocket, fighting inside for a short bit and then coming back out into the light, I had to take down a helicopter before the level and demo ended. It tried taking me down with its mini-gun, but as it was slow moving from side-to-side, you can outrun its movement and stay way from the gunfire, very much like an old-school boss fight. On the downside it appears the game will only feature local co-op via AD-HOC connections, no internet play. On the plus side, you'll be able to high-five your real life co-op partner while playing. Page created in 0.2479 seconds.